Doughnuts on a String is "bobbing for apples" in reverse. Instead of dunking your head into water, you're stretching as high as you can to nibble on dangling doughnuts. The doughnuts bob and sway, which is challenging enough, but then add the extra touch - NO USING YOUR HANDS. Make sure you string up plenty of doughnuts, because everyone will want to do this more than once, guaranteed. 1. Stretch a clothesline across your playing area. If you are playing indoors, it is smart to lay down a tarp or newspaper. A. Cut string or yarn in 1 to 3 foot pieces (how low your clothesline hangs will determine how long your string is - you will want the doughnuts, when hung, to dangle about 2 inches above your smallest guest's head). B. 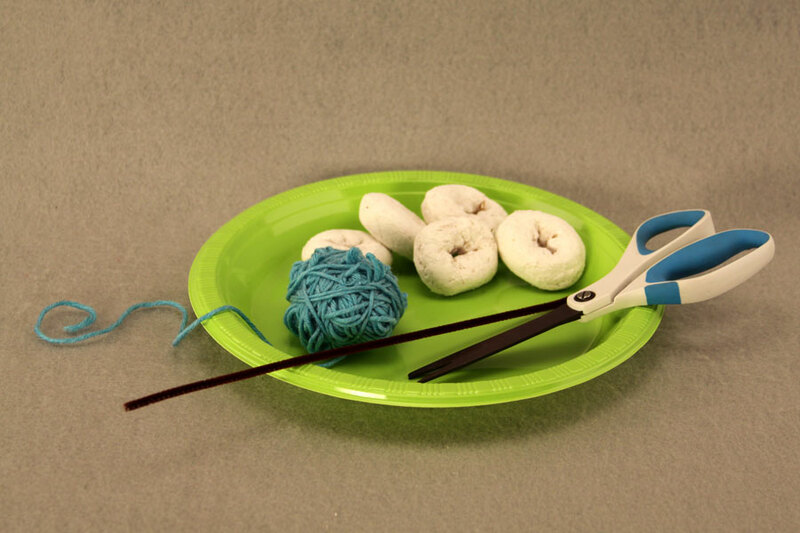 String each doughnut with a piece of yarn. If your hole is rather small or baked shut, use a pipe cleaner to make a needle. 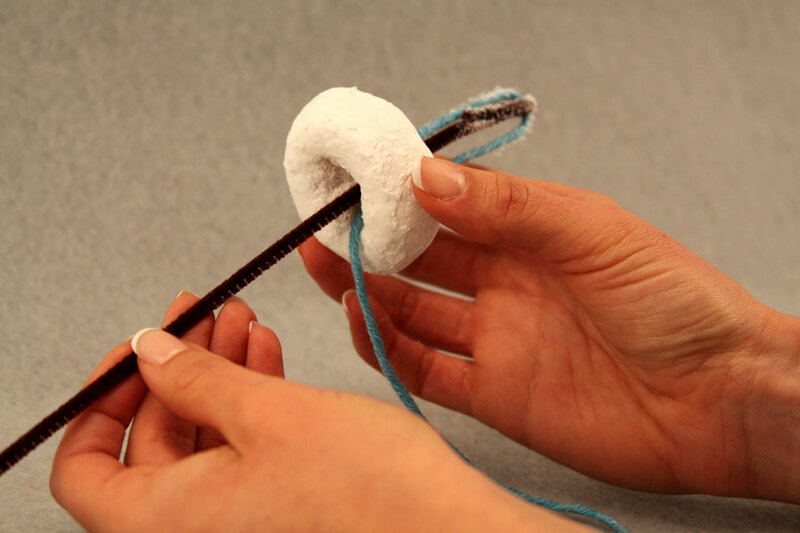 C. Tie the string so that it makes a "doughnut necklace." D. Secure the doughnut to the clothesline by either sliding the "necklace" over one end of the clothesline, tying the string directly to the clothesline, or by clipping with a paperclip or binder clip. 3. Make sure the doughnut are spread out enough so that all players have room. (If you have a tight space and too many players, play in shifts). 4. Have each player choose a doughnut and stand in front of it with their hands clasped firmly behind their back. 1. On "Go!" players attempt to eat the entire doughnut without the aid of their hands. 2. Players may stretch, bend, or in some cases kneel down to get under their doughnut. 3. The player that can eat their entire doughnut, without dropping most of it on the ground, in the fastest time is the winner. 1. For a winter-themed party, use powdered doughnut and call them snowflakes. 2. For small groups you can do a time challenge - see how many doughnut one person can eat in say a minute. Only full doughnuts count! 3. Play as a relay race, with team members taking turns one at a time. 4. If you don't have a place to string a clothesline, have players work in teams. Have one player sit in a chair or kneel on the floor, and have the other player dangle the doughnut for their partner.